It was printed on the box, "Maximum weight: 14kg". "Eh, still can!" I turned to the hubby, "Girl is only 13.5kg!" So despite actively refusing to splurge on a uber expensive carrier for the last 2 years, we finally surccumbed and got one. 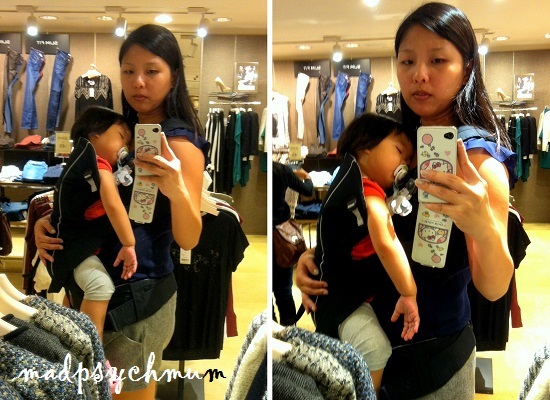 Baby Bjorn Comfort Carrier was at 45% discount at the Expo Baby Fair so we just had to get it! Most of the people we knew said it was awesome for carrying their kids, who are all younger, and if I might add, much lighter than my girl! So I thought I would conduct an experiment to test just how good the carrier was for kids who are almost reaching the maximum stipulated weight allowed. The experiment was conducted over 2 separate occasions. It was the first time that I was using the carrier with her so I didn't want to be too ambitious. She has a habit of taking a short nap after school so I knew it was the most opportunistic time to test it out. The carrier was easy to put on and fit really well. I reached home feeling great but then again, most of my journey home was spent on the bus so that was hardly surprising. Route: Wheelock Place, Shaw Tower, Wheelock Place, Ion, Wisma Atria, Takashimaya. I needed the carrier for baby girl's nap again so I carried her in the carrier while I went shopping with my mum and sister. As we didn't stop for a break, I started to feel my back ache after about 45 minutes. But I could still bear with it till she woke up 2 hours later. But just as I thought I should be able to use it for another 3 months at least, my mum-in-law became the messenger of bad news. "I got her to stand on the weighing machine today leh," she said in Mandarin, "guess what's her weight now?" There was a very dramatic pause as I didn't respond for fear of what I'm going to hear next so she continued, "without wearing any diapers hor, she is 14.1 kg!!" I exhaled an audible sigh, "well, that means our carrier can only use another few weeks at most.. sad."